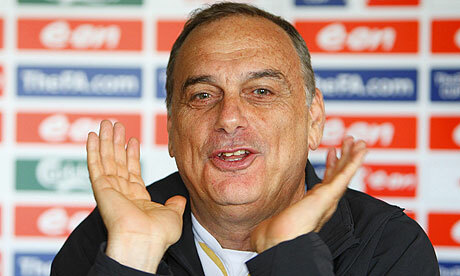 i have to imagine that avram grant is making this face after being asked if he's staying at portsmouth. well it seems like this has become less a blog about soccer, and more a blog about apologizing for not blogging about soccer. and while i feel that my series of recent prolonged absences on the blog can be easily justified (starting a new job, moving into a new house, increased travel for work, planning for the wedding), there is no doubt that they are all nothing but silly excuses for not doing my job. and with the world of football bursting at the seams with stories of all sorts (domestic competitions wrapping up, preliminary world cup roster announcements, early summer transfer fodder, etc. ), i feel like i’ve let a lot slip through the cracks and haven’t gotten to post as much as i would like. so again, i’ll take the lazy road out to — if nothing else — make myself feel better. so here comes my second edition of ten words or less.